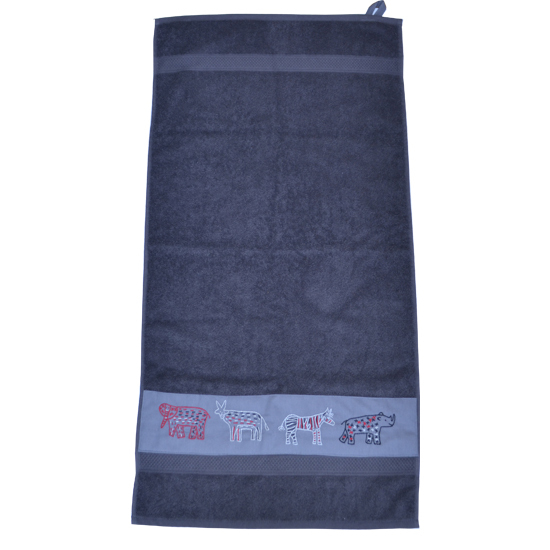 Cotton towel with wild animal motifs embroidered strip, made by Penduka artists from the slums of Katutura district, Windhoek. Available in grey with grey/red/black coloured stitching. Size 45cm x 90cm. Cotton towel with wild animal motifs embroidered strip, made by Penduka artists from the slums of Katutura district, Windhoek.The love and fear for the wild animals makes the women tell many stories of what happened in the past. The elephants destroying the harvest when they came with big feet into the Mahango fields. Available in grey with grey/red/black coloured stitching. Size 45cm x 90cm, machine washable at 60 °C. For other specific colour/size variants or personalised motifs please contact us.